Frank Hinder’s early development as an artist was shaped by a remarkable period of training in the USA, where he first encountered the theory of dynamic symmetry, a method of linking the natural world with a mathematical pattern. 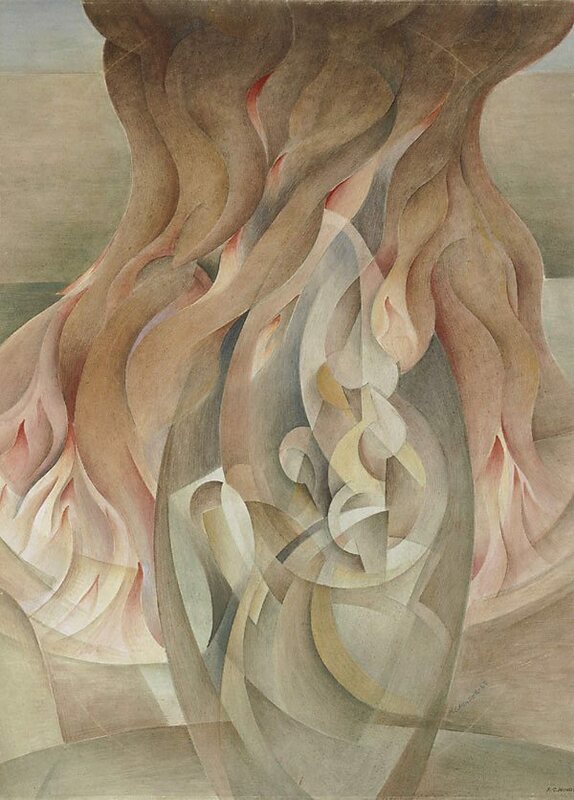 Hinder was also attracted to the philosophy of the futurists, but his main interest was to create unity from complexity and order out of chaos. 'Bomber crash', his war-time depiction of a burning plane, perhaps came closest to that glorification of speed and mechanical energy embraced by the futurists. It was inspired by an incident that took place in New Guinea during his service in World War II as a member of the Camouflage Unit. Hinder translated the trauma he experienced when his plane crashed and burst into flames into a series of small watercolours and Bomber crash. A second work in this series is held by the Australian War Memorial. Signed and dated l.r., pencil "F.C. HINDER 43". Signed l.r. corner, tempera "F.C. HINDER". The art of war , Carlton, 2004, 116. NOTE: this version of 'Bomber crash' is from the collection of the Australian War Memorial. Australian Modern Painting Between the Wars 1914-1939 , 'Quest', pg. 104-113, Sydney, 1989, 107 (colour illus.). Renee Free, The art of Frank Hinder , 'Part 3: Geometric abstracts', pg. 92-119, Sydney, 2011, 104, 105, 106 (colour illus. ), 107. NOTE: Related work 'Bomber Crash' 1943-49 in the collection of the Australian War Memorial is reproduced on page 107. Jill Sykes, Look , 'Frank Hinder: his legacy revealed on page and screen', pg. 18-20, Sydney, Oct 2011, 18 (colour illus. ), 20.